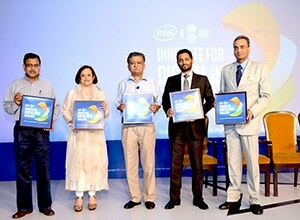 Intel and the Department of Science and Technology (DST) have launched the “Innovate for Digital India Challenge”, which will focus on the creation of products to increase technology adoption in India that will eventually result in the creation of a local technology ecosystem. It will be open to aspiring and existing entrepreneurs, innovators, academia, designers, engineers and makers from diverse backgrounds. Participants will be provided mentoring by industry stalwarts and Intel experts, assistance in terms of technical know-how, access to product kits and infrastructure, and commercialization opportunities. They will also be offered market linkages and access to funds at various stages to help make their ideas a reality. The challenge was designed in collaboration with DST, with support from the Department for Electronics and Information Technology, MyGov.in and will be managed by IIM Ahmedabad’s Centre for Innovation Incubation and Entrepreneurship (CIIE). R S Sharma, Secretary, Department of Electronics and Information Technology (DeitY), Ministry of Communications and Information Technology, Government of India, led the launch event together with H K Mittal, Member Secretary, National Science and Technology Entrepreneurship Development Board (NSTEDB); Gaurav Dwivedi, CEO, MyGov.in; Professor Rakesh Basant, chairperson, CIIE; Vikas Jain, co-founder, Micromax Informatics; and Debjani Ghosh, Vice President, Sales and Marketing Group and Managing Director, Intel South Asia. The challenge aims to encourage the creation of intuitive, easy-to-use solutions that can increase access to critical services imperative for development. Eventually the best ideas will get help for commercialisation leading to the creation of a local technology ecosystem furthering the government’s Make in India vision. The challenge will encourage the application of the principles of frugal innovation and a strong understanding of Indian lifestyles. It will focus on innovation in two broad areas. The first is innovation to create the ideal citizen’s device platform, including biometric sensing capabilities, peripherals using other sensors, intuitive user interface, gesture recognition, multilingual support and voice support. The second area is innovation to deliver eKranti*/MyGov applications to accelerate delivery of e-governance services on a mobile platform.